Leaving Aberdeen at 6am we were headed to Leeds for our first road game of the year against the Yorkshire Rams. 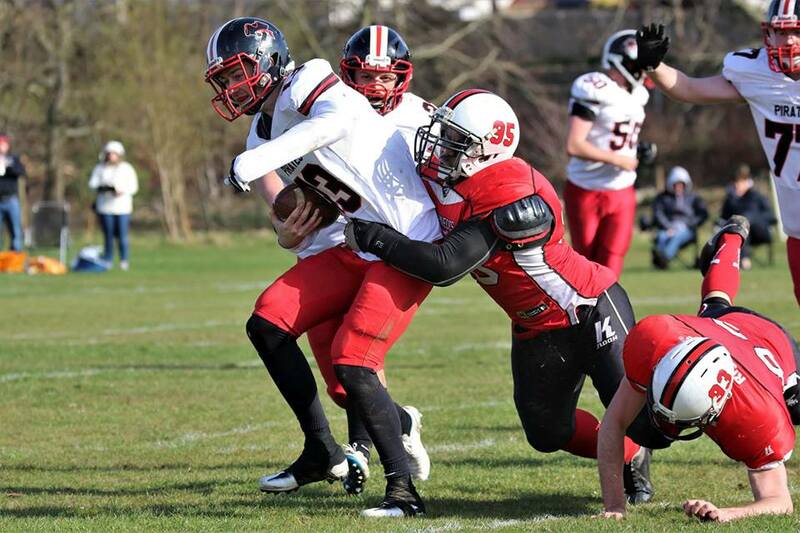 Having finished 6-4 last season behind the Northumberland Vikings and Lancashire Wolverines, the Rams would be looking to get their season going with a win having been touted to be in contention for the division crown. Having chosen to receive the opening kick-off the Rams offence struggled to get their run game going as the Roughnecks front 7 on defence swallowed up running backs and the quarter back in the backfield allowing the Roughnecks offence to take to the field and whilst a punt ended the first drive of the day they never looked back. Quarterback #16 Chris Breen would get the scoring started as he found Tight End #85 Rob Hayes in the endzone on a long pass downfield on third down; Roughnecks 7, Rams 0 with a successful PAT. A short Rams drive later would end with a botched punt snap which #27 Ross Herbert scooped up only to be stopped at the Rams 1 yard line. Running back #35 Dave Obatolu would happily then take to the field to convert the turnover into 6 points powering his way into the endzone however a blocked PAT would leave the score at 13 - 0 at the end of the 1st quarter. Kicker #4 Stuart Don would make it 16 - 0 with a successful ~30-yard FG early in the second period, and a turnover from DB #22 Gamuchirai Mukuredzi would provide #35 Dave Obatolu another opportunity to find the endzone. This time he would receive a short pass from QB Chris Breen before taking the ball 35 yards, weaving through the Rams defence; Roughnecks 23 - 0 Rams, this time with K #23 Phil McCall tacking on the extra point. Pinning the Rams offence back from the ensuing kick-off would let the defence pin their ears back and getting pressure on the QB led to an intentional grounding penalty in the endzone, which by rule is a safety. 2 points to the defence, and a 25 - 0 lead at half time for the Roughnecks. Determined not to give anything away in the second half, the defence continued to stand resolute forcing and recovering fumbles to get the offence back on the field and earn much needed rest on what was a sweltering Yorkshire afternoon. On one such occasion however Punt Returner #6 Lewis Hughes would ensure that rest wouldn’t be for long, almost finding the endzone on a long return only to be stopped agonisingly short, allowing #35 Dave Obatolu to complete a hat-trick in the 4th quarter again powering in from close-range. With Phil McCall having earlier added his first ever field goal to the score from ~35 yards out, Dave’s touchdown would make it 34 - 0 the PAT hold compromising the kick attempt. A final score of the game would ensure the game ended under a running-clock, with QB #18 Rhys Elmslie having to improvise with a wayward snap , forcing him to roll out of the pocket before delivering a throw to Tight End #85 Rob Hayes who rose above the Rams defence to come down in the back of the endzone. Rhys would then run in the 2PAT making the score 42 - 0 and sealing the deal on what was a very productive day for the Roughnecks. Following the disappointment of last weekend, it was great to be able to make amends and return to .500. We now prepare for the visit of the Northumberland Vikings to the Rig on the 5th of May. Trav really personified what we were looking for on defence yesterday with unrelenting effort, shutting down the run game early and with the help of the rest of the front 7 never let up. All day long the offensive line gave both Quarterbacks all day to deliver dimes. Gus stood out standing strong and giving up nothing to the Rams D-Line. Dave found pay-dirt 3 times and ran hard all day, carving through the Rams defence and carrying defenders with him. ‘Being less than a week away from the regular season opener against East Kilbride Pirates I am glad of this opportunity to reflect on our preseason and look forward to our first season in Division One. Having taken over as Head Coach on a full time basis I wanted to build on the terrific work Coach Collinson had done last year as the Interim Head Coach, working together to ensure that this team was put in the best position possible to succeed. We also brought back Coach Pirie ST Coordinator and he has also become the OL coach this year. With the addition of Matthew Watt and Nathan Morrice - RB coach and Defensive assistant respectively - I couldn't be happier with the work ethic and knowledge these 2 coaches bring to this team. The team have responded terrifically well to the new coaches coming in and I am very excited to help them grow in their roles within the team. We started the year off in January with a 3 day residential camp in Dunfermline where the guys were pushed to their limits both mentally and physically to ensure they would be able to deal with any situation they are confronted with. We took it right back to basics and the camp was a huge success for both the players and coaching staff. Camp was where the 4 Captains for the upcoming season were announced and also decided to have positional leaders to oversee all positional groups to ensure accountability was observed. The 4 Captains for this year are OL Andrew Watts, DB Darren Henderson, QB Chris Breen and MLB Robert Hayes. Following on from Camp we have taken part in two organised events with Clyde Valley Blackhawks and the Edinburgh Wolves. Having played a preseason game against the Blackhawks this year it allowed both teams to give rookies their first taste of live game action and in typical Northern football it was a very physical affair with the weather doing everything it could to add to the intensity levels. Next came a situational training session with the Edinburgh Wolves. A thoroughly enjoyable day for everyone associated with the Aberdeen Roughnecks and gave an insight into what is required to taking the next step and we certainly gained a lot from the session. I'd like to thank both Coach Yates of Clyde Valley and Coach Edmonston of Edinburgh for their help in allowing both events to happen and wish them every success in their campaigns this year. This is by far going to be this teams toughest test to date but we wouldn't want it any other way. I believe that the team are ready to take on Division One and hit our primary goal which is to establish ourselves this year in Division One. There will be adversity facing us on occasion this year however with the preseason we have had and the mentality that this team carries I have absolutely no concerns about our mental toughness and strength to face these problems. The coaching staff are doing everything possible every single day to ensure that the players are given the best opportunity to succeed because they deserve it. Our first three fixtures see us at home to East Kilbride Pirates and Northumberland Vikings with a long away day to Yorkshire Rams all teams who will have the desire to be top of the North when it's all done. This provides us with a massive opportunity to test ourselves against some of the most ambitious teams in the country and we want to come out of all 3 games with positive results. I'm very much looking forward to being on the sideline this year and seeing the familiar faces spectating and cheering the team on. 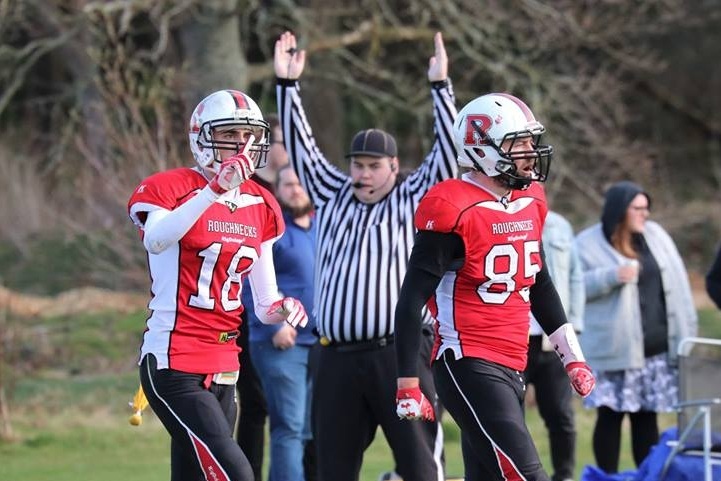 A lot of our followers have been around the team since the beginning of the Aberdeen Roughnecks and I am looking forward to seeing them cheering us on at the highest level this team has competed at to date. "A great player has the ability to win any game, but a great team has the ability to win every game."